I've been thinking of my 2016 word of the year choice for a couple of weeks now. I was pretty sure that it was going to be HEALTHY, so it's very ironic that as I type this I can barely stand up due to a sore back. I really need to be HEALTHY right now. I also really need my family to be healthy, though thankfully, Hilary is on her way there! These are all areas that I don't give enough attention to. It's easy to get caught up in the day to day requirements of life and to let things start to slip. So for 2016 I'm going to keep being HEALTHY at the forefront of my thoughts. *Caveat - this one starts on January 7th after my GallBladder surgery. I’ve had my hearing tested a few times in the past, so I had a baseline when I went in a few weeks ago for another test. I was missing out on a lot more conversations lately, having to get people to repeat themselves more and just generally noticing the loss more. Hearing loss is measured in decibels from 0-130. Normal hearing is considered anywhere in the 0-20 range and complete deafness starts around 90. It’s also measured across several different frequencies. You can have more of a loss with high pitch frequencies or low, deep frequencies. I have a mild hearing loss in the higher frequencies. Compared to my last test from 2 years ago, I’ve lost about 10 decibels over all. My hearing also tested worse if there is any sort of back ground noise. It was time to discuss solutions. I’m already using as many “tricks” as possible. I keep people on my right when we are walking and talking; I make sure that I can see a person’s face when we are in conversation; the phone is turned up as loud as it will go and we’ve used the close captioning on our TV for years. I’ve even used the closed captioning devices at the movie theater. 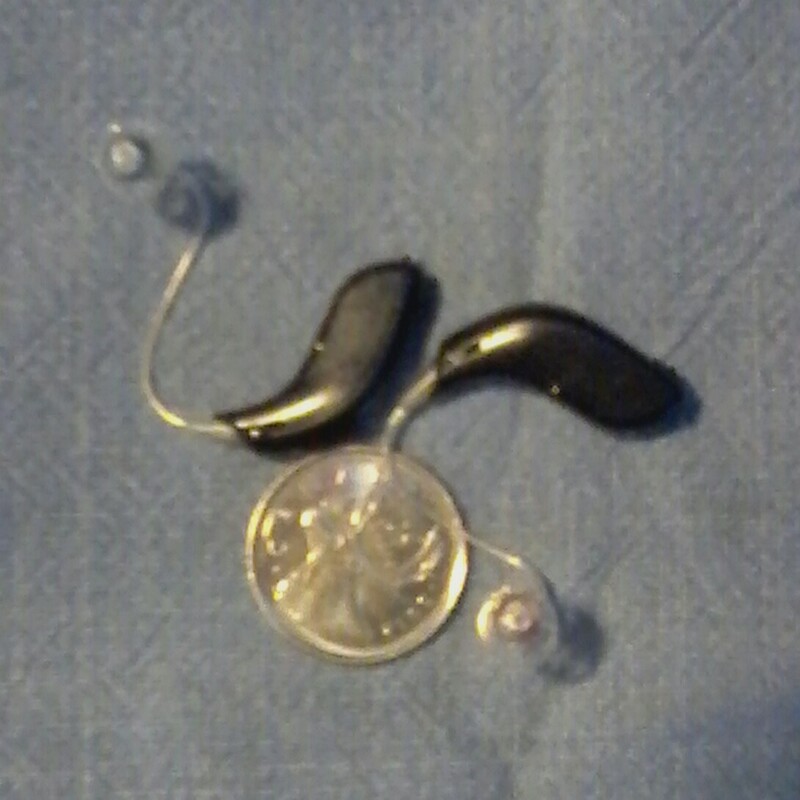 After some discussion with the audiologist, I decided to try hearing aids. Since my hearing loss is fairly even in both ears, I would need 2 to keep things balance. Luckily they offer a 30 day, no money down, trial period. I didn’t expect to find a lot of difference with the hearing aids in. After all, my hearing loss is minimal. But what a difference they have made! The first thing that Hilary noticed was that I wasn’t talking as loud as I usually do. When you can’t hear yourself, you naturally increase your volume. Conversations have been easier and clearer. I’m not missing key information from dialogue on TV. At work I was able to participate in a group conversation, where I would normally have just sat back, smiled, nodded occasionally and laughed when everyone else did because I couldn’t follow what was being said by everyone. It’s been less than a week but I can already say that the trial is a success. I will see the audiologist again next week to check in on how it is going. And then I will have to make the big decision on whether or not I keep them. They are a significant financial investment, and while they are wonderful and do make a difference to how I hear, I’m not sure I’m ready to fork over that much cash right now. My word of the year for 2015 was DETERMINED. I had many categories that I was determined to do well in, or improve upon. Well. 2015 turned out to be a very interesting year overall. I did not do as well at TKD as I had hoped, mainly because I stopped going in February. Training for a half marathon takes up a LOT of time, and I just didn't have an extra 3 hours a week to attend classes. Or so I told myself. I didn't really eat healthier this year.... I sorta did in the first half of the year, but have fallen so far off the wagon that I can't even see it's tire tracks any more. I've laughed and loved and enjoyed life. And to me, those are the 3 most important points. 2015 brought so many things with it. A great family vacation, wonderful visits from relatives, the kid growing into a teenage and of course, the dreaded cancer and the awfulness of it's treatment. But for all it's horrors, the treatments worked and we are no longer living with cancer amongst us. That alone is letting 2015 finish out as a great year. I think that being DETERMINED has served me well for 2015. Every year the grade 7s at Liam's school study a Shakespeare comedy and then put on a stage production a a local theatre. This year was Liam's turn to star as Conrade in Much Ado About Nothing. The kids all worked on making the sets, but they had proper theatre costumes. Liam was not impressed that he had to wear tights, but he managed. Unfortunately because of his injured toe, he couldn't wear his boots. All the kids did an amazing job, delivering their lines on time and with a lot of humour. Liam isn't planning a career in acting, but he had a wonderful time last night!